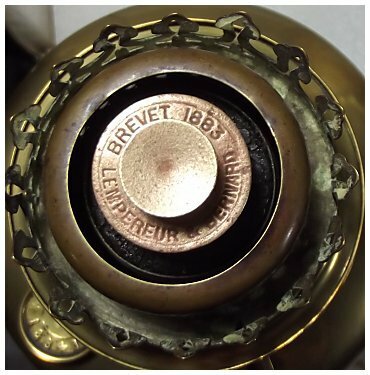 Patented in 1884 and manufactured in Liege by Lempereur & Bernard, L&B. 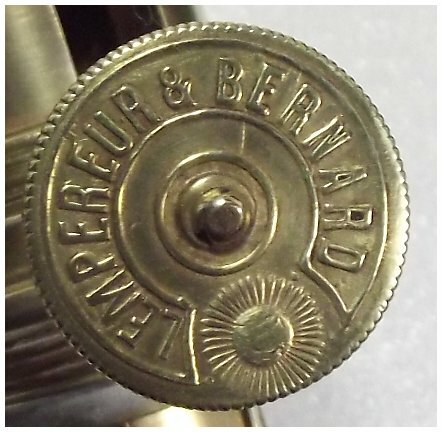 These were widely sold in the USA by the Belgian Lamp Co, and marked on the winder knob L&B with a smiley-sun face. In the UK they were mainly sold by Lewtas of Manchester, the knob marked LM with a smiley sun face, and marked on the fount or filler cap 'Lampe Nationale'. A few are also found in the UK marked L&B. 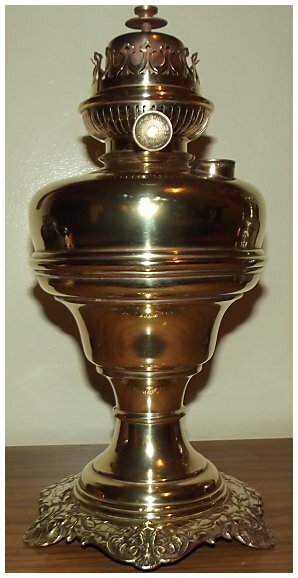 The Example shown is a L&B marked one, in the form of a patterned brass drop-fount which fits into a bottom-ventilated ceramic vase to form a table lamp. 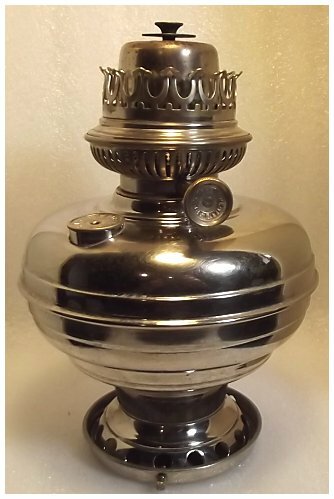 Spares available for these lamps include Flame spreaders, wicks, chimneys, and four inch base shades. 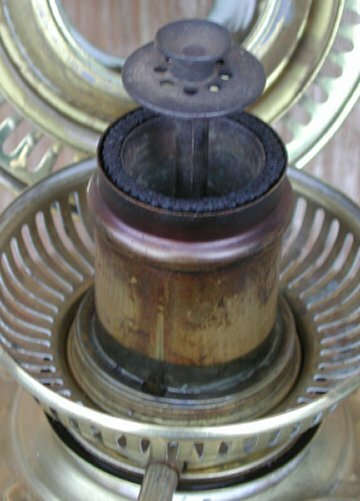 Close up pictures of the burner show correct placement and proportion of the spreader, also correct relative height of the support pin and inner/outer wick tubes. These lamps burn with a taller, narrower more 'wine glass' shaped flame than most others. 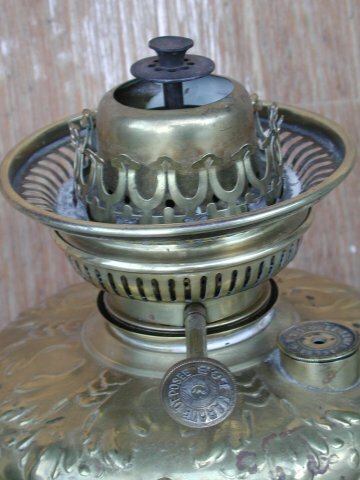 These lamps have a fixed steel pin in the centre of the burner. This is in turn supported by a brass 'tripod' inside the draught tube. The top of the pin stands approx level with the top of the wick tubes. The spreader has a tubular leg that slides over this pin. Lamps often have this pin ripped out to accommodate electric fittings. 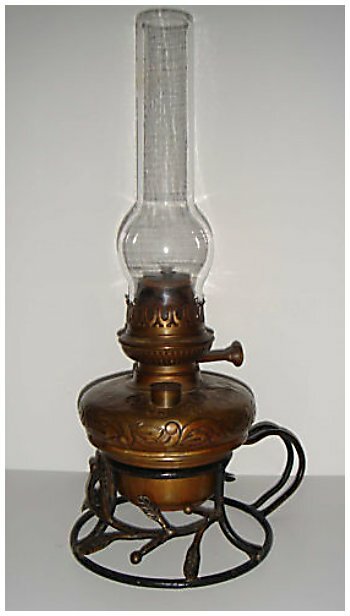 L&B began making lamps prior to their 1884 patent for center draft lamps with flame spreaders. 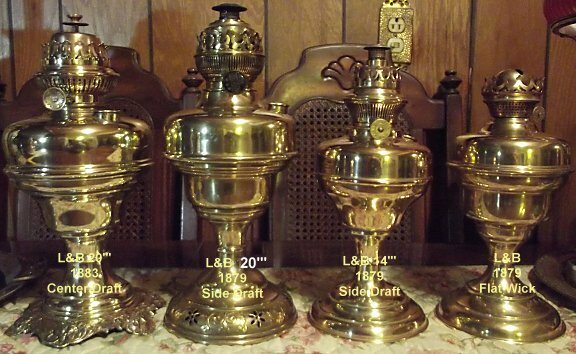 Indeed, L&B produced limited numbers of center draft lamps in 1883. These lamps are rare and are obvious due to the different shape of the font than subsequent lamps. The US Patent of Dec. 29.1884 by Joseph Lempereur and Lambert Bernard of Liege, Belgium (US Patent No. 333237) was clearly after the January 14, 1884 timble flame spreader patent of Leonard Hinkle (US Patent No. 292114). 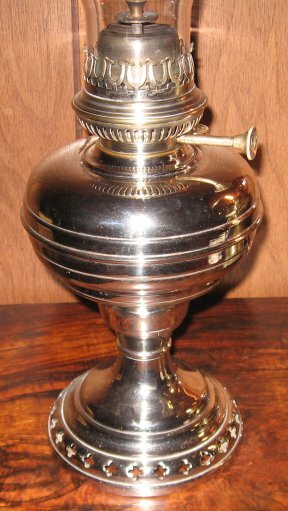 However, evidence exists (below) that L&B were making lamps using both pedestal and thimble flame spreaders in Europe prior to the introduction of flame spreaders in the US. Emil Wild of Berlin patented a lamp, chimney and flame spreader on August 19, 1884 (US Patent No. 303774). The lamps shown below are mine except where noted. 20''' L&B center draft, 1883. Note shape of font. Above, signed cast brass foot. Below, dated flame spreader. 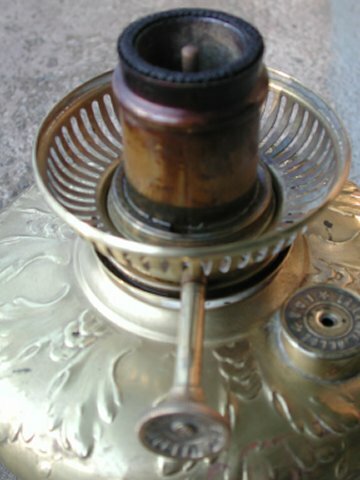 Burner with flame spreader on 1883 20''' Center Draft lamp. Note wick winder is unique. L&B 1879 side draft Matador. The font is the same as the 20''' above, missing only the draft tube. L&B 1879 14''' side draft with thimble flame spreader. 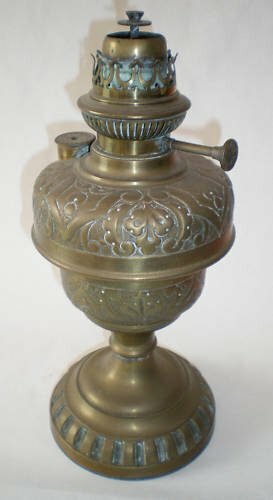 L&B 1879 - 1883 Flat wick lamp. Note upper half of font shape. Size comparison of the lamps above. Later model 20''' center draft. Same model, embossed 1883 L&B, embossed, before restoration. Owned by Peter Brickell. L&B 20''' hanging lamp L&B hand lamp, Owned by Peter Brickell. 15''' L&B side draft. At right, two L&B 20''' Matador burners. 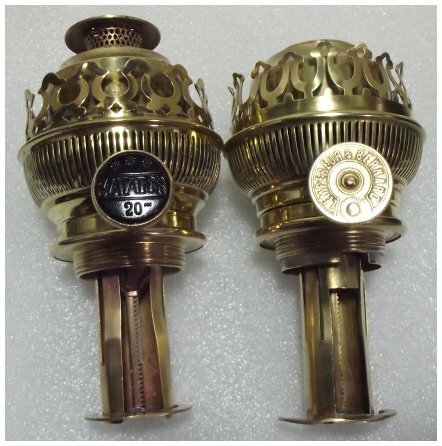 The burner on the left has wick knob indicia "Matador 20''' ". 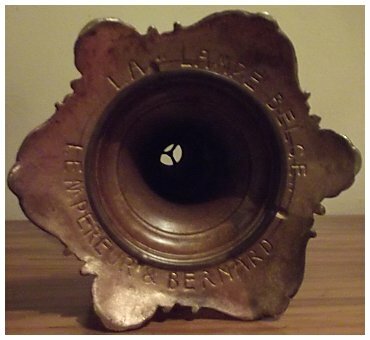 The base of the burner is marked Matador 20''' * Importe D'Allemagne." This burner was apparently for the French market. 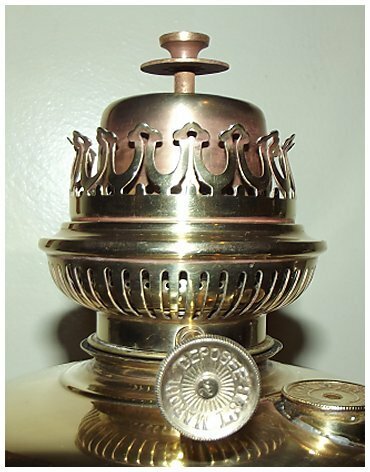 The burner on the right is marked on the wick knob "Lampereur & Bernard" with a small smiley face. This burner was apparently for the British market. At right, the two burners above apart. There are minor variations between the burners but that could reflect different years of production. 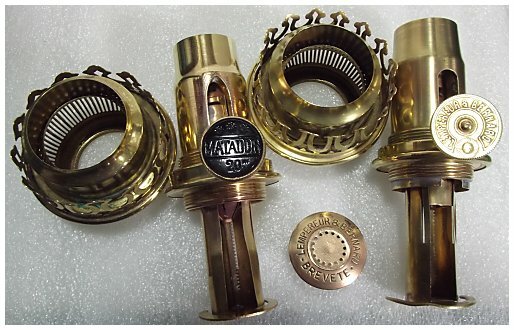 There are more photos of L&B burners on the Center Draft & Side Draft Lamp Wick Assembly page. Click here. L&B US Patent #333,237, Dec. 29.1885. pdf file.